This past Saturday morning we met down near Forsyth, Georgia, to celebrate the life of JL Parker, who passed on September 27th, 2017. I have written down my memories of the funeral services for those who could not be there, and for posterity. As I exited the highway I noticed that my car’s low fuel indicator had come on during the drive down to the funeral. I couldn’t help but think back to a time when JL’s crew had kindly filled my tank on one of those occasions when I was young and dumb and had coasted on fumes to set. As I coasted down the final quarter mile to the church on Saturday I was surprised to see a big tractor trailer rig emblazoned with the TEAMSTERS logo. It was an impressive honor from the union that JL had belonged to for so much of his career in the motion picture industry. And then, as I began to turn into the driveway, I saw the Blue Truck. A sob caught in my throat. If you’ve never heard of JL it either means that you’re not in the movie business, or you haven’t been shooting in Georgia for more than a few years. JL and his wife Cindy were a part of the bedrock of Georgia’s film and television industry for decades. To many of us they’re a single unit – you say their names all together as a single word. They were a matched set. Together, they ran the Transportation department on dozens of projects, from features to movies of the week and everything in-between. They were beloved by so many people, from movie stars and big time producers to honeywagon drivers and prop guys. 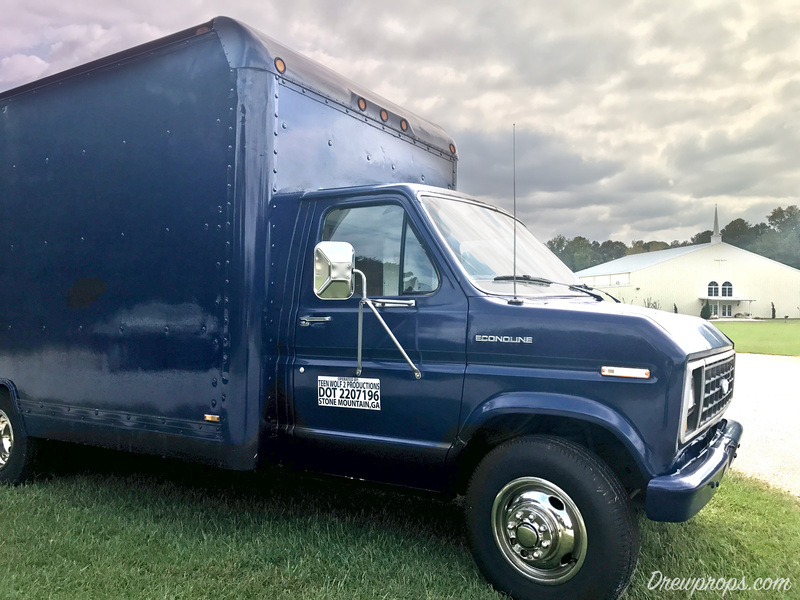 A big blue Ford Econoline cube truck was their home as far as some of us were concerned, because that’s the place we always saw “Miss Cindy”. The drivers who worked for JL-and-Cindy would snap to attention when they heard the call “Come to the Blue Truck” – it usually meant that they were about to be sent on an assignment. I don’t think it was like going to the principals’ office – at least not usually. The first person I saw when I pulled up was Drew Fuller, who I have long known as a costumer. Drew was preparing his young son and daughter to go in to see Miss Cindy. I almost asked him to check my tie but then cars began to fill the parking spots around us. I knew all the people in those cars because we used to work together when you knew pretty much every person on set. Back when JL and Cindy began their career Georgia’s film industry could be described as “primitive“. Our state didn’t have the resources that California enjoyed – you had to make up for those missing elements with sheer ingenuity. JL had ingenuity to spare, and he was funny as heck. He had that gift that few people possess: the ability to captivate a listener with a story. I always felt cheated if he was too busy to tell us a joke or a story. Thankfully, JL passed that gift on to his children and grandchildren. The people pulling up to park around me had all seen the blue truck – you could see it in their eyes and the set of their jaws. It was a powerful symbol. As I got near the church I saw the hearse and the cars parked behind it. Having been to dozens of funerals in my life, I immediately realized that I needed to park in the line of people going to the graveside service so I went back and moved my car into the line. A table was set up with photos of JL throughout his life, from young man to grandfather, and showed stills of him from some of the movies he appeared in as well. The men who were helping to seat people in the church had a heck of a time getting the movie crowd to sit down. If they expected solemn decorum they were sadly disappointed. People kept popping up and moving around to shake hands and hug necks. Nearly every aspect of a shooting crew were represented, from grip and electric to assistant directors and producers. And of course there were the drivers. At some point I realized that the only time I had not experienced this bittersweet reunion was at my own father’s funeral in March of last year. My heart was somewhere else on that day, and I don’t remember many moments from the service. I suspect the same was true for some of JL’s folks. The previous night at JL’s viewing at the funeral home I had asked his grandson Kerry if an elderly movie star friend of the family felt well enough to travel up for JL’s funeral – the answer was “no”, he just wasn’t able. If you live long enough you’ll probably miss your chance at a star-studded funeral, but that extra time spent with family is so much more valuable. JL’s family made sure to give him as much family time as possible right up until it was time to say goodbye. The closer we got to the time for the service to begin, the more I began to slip down into myself. The service was delivered by Reverend Bob Hooks, Senior, a good old Baptist preacher who made sure to remind us that this was a celebration of life. He shared a story from the family. When JL was 13 he went to a tent revival where the preached gave a sermon on Romans 10:13 – “whosoever shall call upon the name of the Lord shall be saved” – and right there at age 13 he gave his life to Jesus. And there in his 80s JL knew that God would keep that promise. Reverend Hooks was followed by his son, Bob Junior, who expressed the love that JL’s church family had for him, and spoke of his conviction that JL was now in Heaven. Gary Lewis, President of Lightnin Rentals, stepped up next to share his memories of JL. The story that stood out was when Gary and his wife were in the islands with JL and Cindy and they decided to attend a local church service. They slipped in and sat on the back row of the church. After about the third hour of the service they realized that the service was just not going to stop so Gary elbowed JL and they all slipped back out the door. Gary then shared an incident which had happened not long before JL passed – he woke up one morning and was remarkably lucid for 5 or 6 hours – a remarkable gift. JL’s grandson Chris stepped up next to discuss how he felt honored and thankful that he was able to call JL “Papa” – and employing the family gift, he had us laughing in short order, even as he prepared to read John 14:1 from a Bible that had been printed in an “unnecessarily small font”. He shared stories of everything from his Papa’s terrifying snot rag to the way he and his brother and cousins would be decked out in striped tube socks from K-Mart on their summer vacations to Pigeon Forge. Chris shared the story of JL’s kindness to a hungry stranger, and reminded everyone of how many JL Parker stories there are out there in the business. Our friend Robert Ballentine stepped up next to share his memories of what JL had meant to him as a young van driver. As much as it amazes me, Robert is undeniably AARP material these days and has a gaggle of children of his own. He has also gained a lot of perspective on his life. It was the voice of sound mixer Jim Hawkins, who has a bit of a reputation for demanding clean recordings. We all burst out in gales of laughter. Robert smiled and pulled the microphone closer and continued, sharing the occasions when JL would come and sit in Robert’s van to decompress. JL would share some of the stresses and struggles he was facing with the show, and after a while he would ask Robert how he was doing. Looking back through the eyes of an adult, Robert realized that JL had not come to seek the wisdom of a 20-something van driver, he had stopped in to check on Robert – to see what was happening in Robert’s life and to find out what he could do to help steer Robert “back on course”. I’m sure there are people with similar stories. At the end of the service we rose and the honorary pallbearers moved to their appointed stations. The family was escorted out and we moved to our cars to go to the graveside service. This would be our final company move with JL. Graveside services are usually far more solemn and more difficult for older folks due to the terrain and the walk from the car. It took a few minutes for JL’s coffin to be moved under the family tent and for all of us to move in closer. The bigger the crowd at the graveside service the more difficult it is to hear the preacher, but I was on the side he favored so I heard most all of his message. He shared a story about JL that was new to me, about a time when JL had set out for Atlanta and realized that he was nearly out of gas and had left his wallet at home, finding himself in the unenviable position of begging the store manager to let him fill up with the promise of being repaid later. The man was not buying JL’s story when a sudden gust of wind made JL reflexively reached out to bat away a piece of paper that had nearly struck his face. Looking in his hand he had snagged a five dollar bill out mid-air. But we still have Miss Cindy – and she and Wayne and Gayle and all the family are going to need all of you for some time to come. Right as it seemed the funeral was over JL’s son Wayne, who carries JL’s name, stepped forward and held a small piece of paper up and addressed his father, saying that he wasn’t a singer but was going to do his best to sing JL’s favorite hymn. He then began singing How Great Thou Art. Wayne was in magnificent voice that afternoon. His Daddy would have been so proud. The congregation from Maynard Baptist were terrific hosts. As is typical, the line for food stretched across the fellowship hall so I went with Taylor Knight to get a tea and some dessert instead. Then I went around talking to people. I tried to listen in to every story around me, but I mostly poured tea on my shoes while I tried to balance a brownie on top of a slice of pecan pie on top of a pile of potato chips. At the last, Cindy said that JL finally seemed to rest when his daughter Gayle had told him that they would all take care of each other – that he seemed at peace with the knowledge that his family would be safe as he moved on. Gayle said that the last facial movement that her Daddy made was to purse his lips to receive Cindy’s kiss. I love the chorus of the song “Last of the Family Reserve” by Lyle Lovett and feel that it applies here. This was copied from an online memorial website. I have found that these obituaries tend to be harder to find over time so I am copying it into this blog post. Juliette, GA- Jesse L. Parker, J.L., passed away Wednesday morning, September 27, 2017, at his home surrounded by loved ones. Monroe County Memorial Chapel of Forsyth, GA is in charge of arrangements. Funeral services will be held at 11:00 am, Saturday, September 30, at Maynard Baptist Church, 1195 Juliette Rd., Forsyth, GA 31029, with burial in Monroe Hills Memorial Gardens. Visitation will be held from 6 – 8:00 pm on Friday evening before at Monroe County Memorial Chapel, 86 W. Main St., Forsyth, GA. A second visitation will be at Maynard Baptist Church one hour before the service. 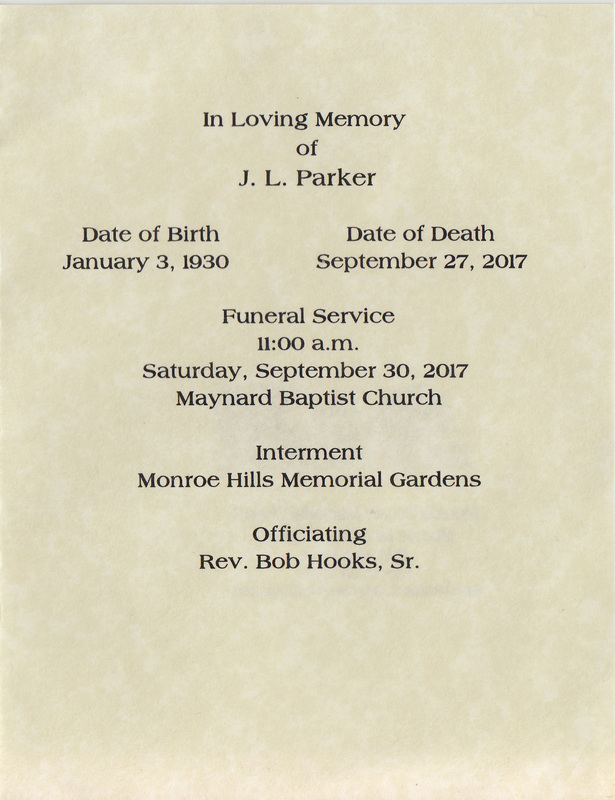 Mr. Parker was born on January 3, 1930 to Jesse Lee Parker, Sr. and Effie Ouida Barton Parker, who predeceased him. He was a member of Cabaniss Baptist Church, Forsyth, GA, where he was a blessing to his church family. 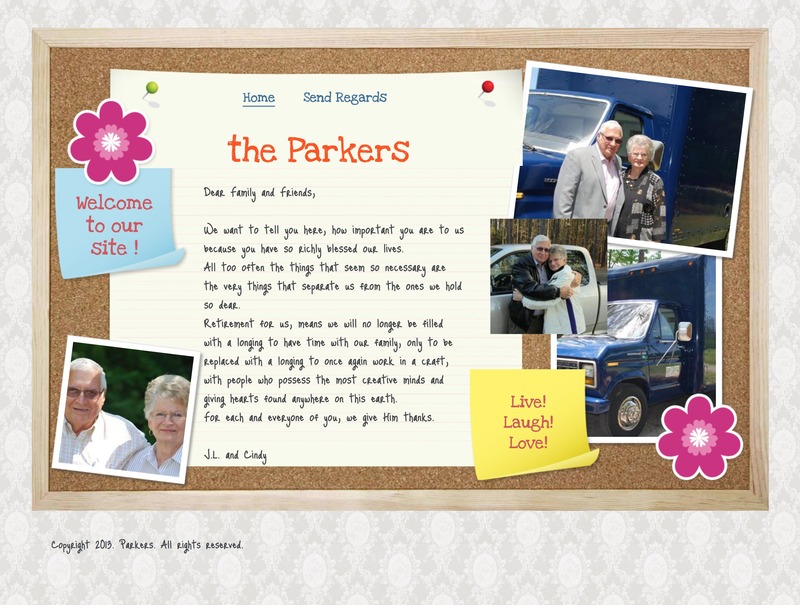 Mr. Parker is survived by his wife of 66 years, Cindy Parker, who was his lifelong work partner and his faithful love and caregiver. Others surviving are his son Jesse Wayne Parker (Angie), his daughter, Gayle P. Rawlins, his sister, Reta Bland, his grandchildren, Chris Rawlins (Renee), Kerry Rawlins (Kasey), Jamie L. Parker (Whitney), Traci P. Chapman, and Savanna Parker. He is also survived by 16 great grandchildren and many nieces and nephews. Jesse Lee Parker, J.L., born into poverty in the tiny town of Pembroke, GA, has amassed, not great wealth, but riches beyond compare through the blessings of his Lord and Saviour Jesus Christ. What earning he acquired he gave to those in need. What knowledge he gained he used to enlighten others. What love he enjoyed was shared by all he knew. Those who survive him will be comforted remembering and sharing many of his numerous stories that have put a smile on countless faces. Those who have gone before him were known to those they never met because J. L. kept them close to heart and spoke of their worth to any who cared to listen. Those who knew J. L. have been made rich, also, by the respect he gave you that never had to be earned, by the needs he met, by the faith he showed, and by the friend he was. During his lifetime J. L. worked in the timber industry, building supply business, and after many years working in the motion picture industry, received a lifetime achievement award from the Macon Film Festival. The family requests that charitable contributions be made to The Alzheimer’s Foundation. Friday evening, September 29th, from 6PM-8PM at Monroe County Memorial Chapel, located at 86 West Main St., Forsyth, GA 31029. Saturday, September 30th, beginning at 11AM at Maynard Baptist Church, located at 1195 Juliette Rd, Forsyth, GA 31029. A visitation took place prior to the service at 10AM. I want to thank Jerrell Skinner for letting me know that JL had passed – he and I shared caretaker notes while he was caring for his mother and I for my father. JL was a father figure to many of us and it meant a lot to be able to be there to honor him, Cindy, and all of their family and friends. Thank you for allowing me to “be there” when it was not possible for me to come. What a beautifully written tribute to this great, great man. He will be missed. Well-written. Happy I got to see you and many others on Friday and sorry I wasn’t there for the funeral. Thank you Drew for this. I will cherish this forever. I must have been in a daze during the funeral and this has freshened my memory. He was my friend , my companion, my work partner, a father, a grandfather, a great grandfather, but most of all he was my darling husband for 66 years and 4 months and he will remain in my heart forever. I love you JL. Mr JL will always be in my heart as he was patient and kind! He was the father every person longed to have I always enjoyed his counsel! My Momma loved the Parkers as much as I did. How the World treats you as you transition says so much about you as a person. JL until the last few weeks was a Man in preparation. In the end, his family showed a love that was the epitome of dignity! Thank you Andrew, you captured this, many heart felt kudos! I cannot say that enough to you and to everyone that held up the Parkers and all their descendents. You did the man and his spirit justice! Beautiful Drew! The funeral was such a wonderful celebration of JL’s life. Royce and I love him and Cindy so much. 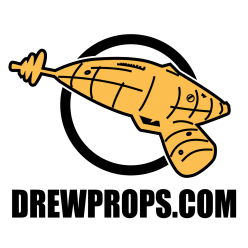 This is beautiful Drew. I am so happy that the stars aligned for me to be able to come & pay my respects to this wonderful man, his beloved wife & beautiful family & to see all of you friends from my former life. Much Love & Light all around. Blessings to Cindy and the families as they continue without this amazing man. JL and Cindy were always so kind to me as a costumer and I spent many years in catering traveling the country with this amazing duo. My aunt Brenda would always say they are just good folks! They don’t make them like that anymore! Drew thanks for sharing this beautiful story of such a great man and his legacy! Beautifully done! It brought tears to my eyes as I turned back the clock to the early days when I was a young stuntman doing Green Beret’s at Fort Benning Ga. Burt Reynolds called and insisted I meet him in Macon to spend the weekend with his two of his closest friends and their young family. Who could this be I thought, some retired football great or Heavy Weight Champion? I was pleasantly surprised and warmly met by JL and Cindy and there then small children and Champions they were and undefeated at that. I loved their home and family and the way they laughed and loved and shared all of it all so unselfishly and abundantly. Wayne was just a kid who loved motorcycles and we had a great time riding as well. Several weeks later I had a few days off and picked up a new Bronco and drove it to JL and Cindy’s to show it off. J.L, came out and gave it the evil eye and insisted that I take his new truck and come back in a week or so as it needed the sound system worked on and he had just the fellow. When I came back it had different wheels, reupholstered and tricked out. As I remember, even though I insisted J,L, and Cindy would never take a penny no matter how hard I tried. Burt Reynolds said, “forget it that is just the way they are!” Burt ended up with it many years later but the times I had in it will never leave me nor will the thoughts of kindness and love that I was shown and the warmth of their home, big hugs, great meals and laughter. Two great individuals that certainly have made a difference in countless lives of which I was one of the fortunate! Love those Parkers and will enjoy eternity with them. What a legacy! Beautifully done! It brought tears to my eyes as I turned back the clock to the early days as a young stuntman doing Green Beret’s at Fort Benning Ga. Burt Reynolds called and insisted I meet him in Macon to spend the weekend with two of his closest friends and their young family. Knowing Burt, I thought who could this be I thought, some retired football great or Heavy Weight Champion? I was pleasantly surprised and warmly met by JL and Cindy and there then small children and Champions they were and undefeated at that. I loved their home and family and the way they laughed and loved and shared all of it all so unselfishly and abundantly. Wayne was just a kid who loved motorcycles and we had a great time riding as well. Several weeks later I had a few days off and picked up a new Bronco and drove it to JL and Cindy’s to show it off. J.L, came out and gave it the evil eye and insisted that I take his new truck and come back in a week or so as it needed the sound system worked on and he had just the fellow. When I came back not only was there a new sound system but it had different wheels, was reupholstered and tricked out. As I remember, even though I insisted J,L, and Cindy would never take a penny no matter how hard I tried. Burt Reynolds said, “forget it that is just the way they are!” Burt ended up with it many years later but the times I had in it will never leave me nor will the thoughts of kindness and love that I was shown and the warmth of their home, big hugs, great meals and laughter. Mr. J.L. Parker was a very kind soul, he was the kind of person who you just felt like really cared. Over the years of growing up with his grandson Kerry I felt like another grandson of his. I would go by many sets over time & anytime I knew that J.L & Cindy were working it I made a point to go and see them. He has shared so many stories with me & I only wish I would have written them down. One of the stories I’d like to share with you all is from many yrs ago. I had taken a job as a P.A on a show in Los Angeles, much to my surprise I found out that J.L & Cindy were heading up the transpo dept.. (I felt great knowing I had family there) Well one of the A.D’s on the show had brought his old dog( with many health issues ) to set and instructed me to make sure nobody gave his dog any food. I remember thinking how much fun that should be. Anyway, as my luck would have it while I was passing crafty someone dropped a few chips and the dog went straight to them. I called for the dog just about the same time as the A.D came around the corner and laid into me about why I hadn’t reached down and taken the chips from the dog. Without really thinking about what might come from my response I said to him “I am not about to reach down and try to take food from a dog who has only known me for a couple of hours !” so as you can guess I was fired. Feeling like a real hot head and upset I went straight to talk to J.L & Cindy if nothing more than to say Good-Bye and I’m sorry for screwing up. They both told me they would talk to the producer and I’m told they said if I left they would to. I will never know exactly what was said but after a few mins passed the A.D came back up to me and gave me my job back. My point is in life you don’t find many people that will go to bat for you but J.L was just that kind of man & I will forever miss “Papa” . I will always be greatful to J.L and the entire family for the love and even the support of getting me into the film industry. Such a beautiful tribute to a legend! !